Not every time an application or a package upgraded to latest version work smoothly. Problems may arise due to bugs in the program or may be due to package incompatibility issues with the existing hardware, drivers, other packages, etc.. Let's take a look at how to downgrade the package. Have you ever been in a situation where the currently installed software package version is not working as intended, while the older version worked flawlessly? The next things that pop in your head are will it be possible to downgrade to the previous version? Downgrading to the previous version of an application is pretty easy. Here is how it goes. Your Linux system generally has many versions of any installed package available in its repositories. Let’s say for example when you update a package the Linux system places the new updated package in a special repository for updates. And for the old package, it is still located in the system’s main repository and can be installed again with a few tricks. In this tutorial, we are going to help you downgrade a package to its previous version in Ubuntu using the command line as well as GUI method. For the sake of illustration, we are going to use the Firefox package to perform our downgrade. In this method, we will use the terminal to perform the downgrade process. If you are comfortable using the terminal, then proceed with the next few steps. Step 1. First things you have to check the current installed Firefox version. 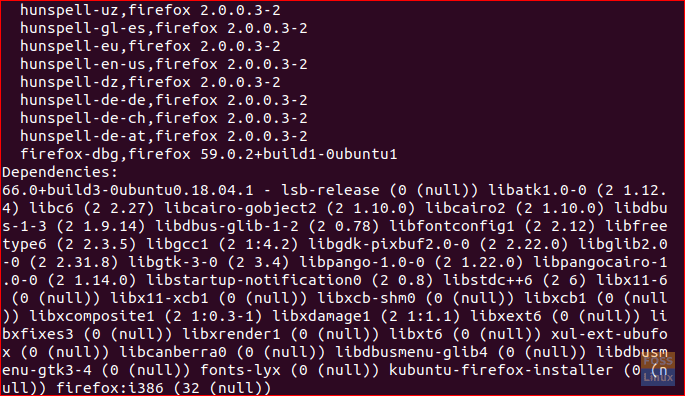 You can get the version number from the Firefox browser help menu, or you can use the next command in your terminal. As you can see from the screenshot, the current installed Firefox version is 66.0. Step 2. Now let’s assume that we need to downgrade to the previous version, say version 59.0 and we don’t have the last package version source. 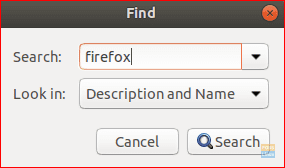 You can use the next command to search the Ubuntu repository for older versions of Firefox. As per the screenshot, you can see the current Firefox package in the repository is 59.0.2. Step 3. 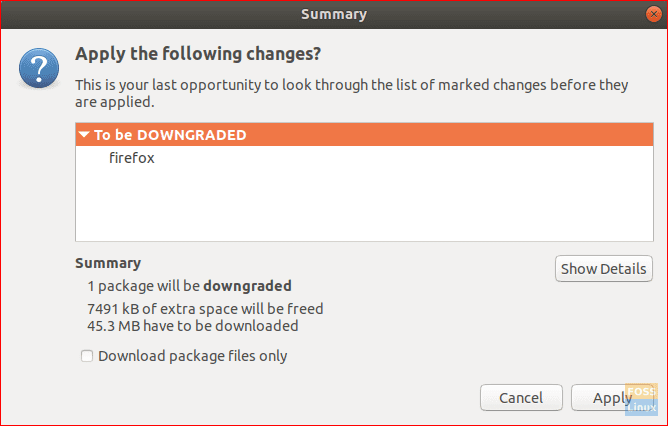 Downgrade Firefox to the previous version using the next command. Step 4. Now, let’s restart all the Firefox services and check the Firefox version. In this method, we will use the famous Synaptic Package Manager to help you downgrade Firefox through its easy graphical interface. Step 1. You can install Synaptic using the next command. Step 2. Launch Synaptic. Enter your username and password. Then press Authenticate. Next, you will see a welcome screen; you can press close to open Synaptic main window. Step 3. Let’s say you need to search for Firefox to downgrade it. From the top bar open “Edit” menu. Then choose “Search” like below screenshot. Step 4. Enter the package name in the search box. Then click “Search”. Step 5. Highlight the Firefox package from the right panel. As per the screenshot, the current Firefox version is 66.0.1. Step 6. After highlighting the package, open “Package” menu from the top panel then choose “Force Version”. Step 7. Choose the from the version dropdown menu the version you want to downgrade to and then click “Force Version”. Step 8. From the top panel, choose “Apply” to apply the changes you have made. Step 9. A confirmation window will appear, press “Apply” to confirm application downgrade. Next, Synaptic will download required package. After the process is complete, notice that the current installed Firefox version is 59.0.2. Also Synaptic will tell you that there is a new version from that application as shown below. Step 10. 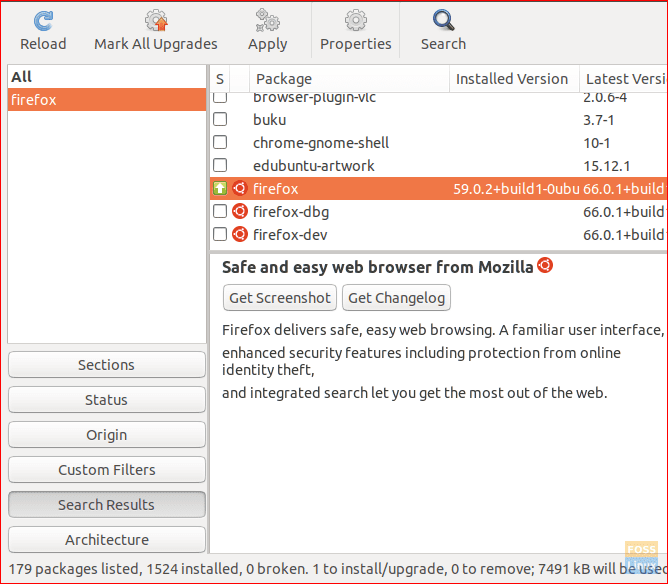 In case you need to prevent your Ubuntu system from upgrading the Firefox package automatically, highlight the package then open “Package” menu from the top panel. Choose “Lock Version”. The package icon now should be changed as you can see in the next screenshot. Congratulations! You have downgraded the firefox package to the previous version and locked it from future automatic updates. Also, you can use the steps mentioned in this tutorial on any package you need to downgrade. Finally, I hope you have enjoyed this tutorial. If you have any questions, leave a comment below and we will be glad to help you. Hi! I'm Hend Adel, a freelancer technical geek with successful experience in Database, Linux and many other IT fields. I help to build solutions to suit business needs and creating streamlined processes. I love Linux and I'm here to share my skills via FOSS Linux! Thanks for reading my article.